Whether mountain sports or hiking, warm underwear from Merino wool is the optimal base layer under the outdoor jacket and trekking trousers. 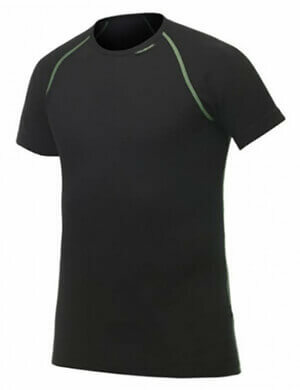 Merino base layer keeps you warm, is ultra-thin, breathable, elastic, easy to clean and odor resistant. Thus, Merino wool is the perfect raw material for the production of Merino undershirts and Merino underwear, for functional underwear in outdoor sports. Even wet, the Merino base layer offers a certain thermal output. And the best: Merino wool is a 100% natural raw material! Where does the raw material for Merino wool underwear come from? The Merino sheep is native to the Southern Alps and provides the raw material for Merino underwear. The animals have to come to terms with extreme climatic conditions. Winters are harsh and summers are hot. The sheep's wool is a kind of natural functional clothing and protects it in winter from the cold and in summer from overheating. Moreover, Merino wool provides natural UV protection. These properties are not only perfect for the Merino sheep to protect itself against the domestic climate, but of course also for underwear made from Merino wool. Manufacturers like Icebreaker, Smartwool, Rewoolution, Woolpower or Ortovox were quick to realize the many benefits of Merino wool and have since then produced high-quality functional clothing either from 100% Merino wool or blended fabrics with Merino wool and other fibers. Merino wool is a true "miracle fiber" and makes Merino base layers into something very special. Especially in the outdoor area underwear made from Merino wool can score with its outstanding features That's why there is now every conceivable base layer item of clothing made out of this high-quality wool, from Merino base layers to Merino socks and again to Merino long-sleeved shirts. In contrast to "normal" wool Merino wool is very fine. As such, very thin tissue can be manufactured, which gives the Merino underwear its great pleasant-to-wear sensation. Merino underwear clings to the skin, never feeling uncomfortable or disturbing even after prolonged periods of use. Another great feature of base layers from Merino wool is its high insulating capacity. Although a Merino base layer is very thin, it keeps really warm, which turns it into an optimal base layer in the onion-shell principle. With warm Merino underwear as a base, you will survive even the most freezing temperatures. In addition, Merino underwear offers great breathability, perfect if you get into a sweat. This brings another positive aspect to light: Base layers made of Merino wool assume no bad odors. So if you are on a longer tour and cannot change your Merino underwear daily, this does not lead to uncomfortable odor nuisance. However, if the Merino base layers must be washed on the way, it is no problem either as Merino underwear is easy to clean and fast-drying and therefore quickly ready for use again. If you thus are looking for something to wear for underneath during your outdoor sports, you should have a closer look at Merino underwear!